I have an official announcement to make: I am a wee bit dense. Well, maybe more than a wee bit in this particular matter. I’ve been rolling this recipe around in my head for the past week, knowing that Cinco de Mayo was approaching. 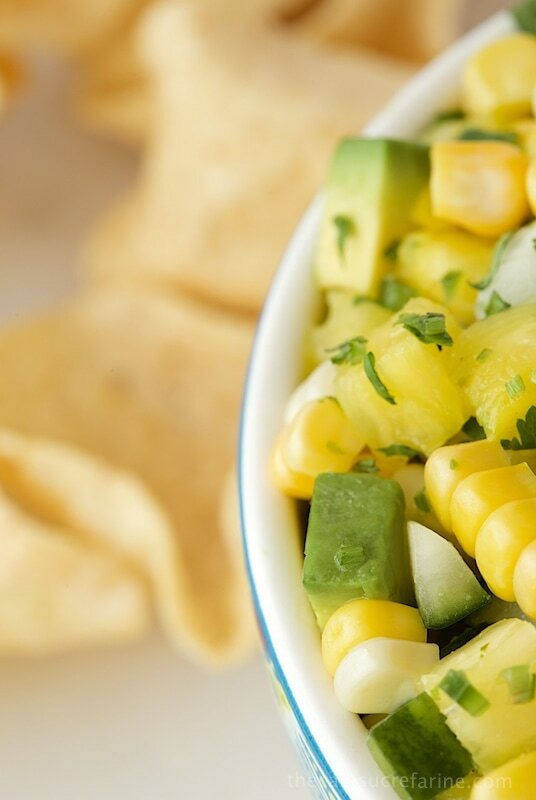 A few days ago, I asked my husband, Scott, “Do you know when Cinco de Mayo is?”, wanting to be sure to get this recipe for Pineapple, Avocado & Fresh Corn Salsa out a few days before the actual celebration day. Very kindly, he said, “Well hon, cinco does mean five in Spanish you know…”. Cinco de Mayo. Duh ………. I don’t know a lot of Spanish, but I do know enough to count in Español. I just never put it together and each year I’ve been trying to remember which day in May (I knew that much) the festive Mexican holiday falls on. The revelation was really quite embarrassing, but I’m hoping you’ll enjoy the recipe despite my lingual ignorance. Like I said, the recipe’s been in the making for a week now, ever since I got an email from my friend Angela, at The California Avocado Commission. She wrote to let me know that I would be receiving a shipment of fresh California avocados this week. 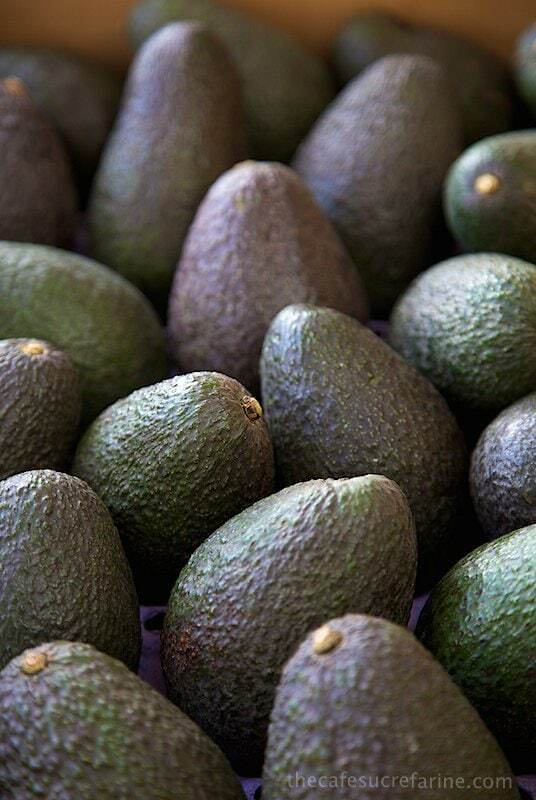 The avocados were sent as part of a celebration announcing the beginning of the California Avocado season.” Woo hoo! How exciting, I couldn’t wait! The avocados came yesterday, and they certainly are beauties. I’ve had fun, since I received the email, thinking about how I would use my delightful, unexpected stash. This salsa is one of the recipes I came up with. 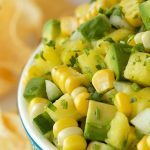 Along with the creamy diced avocado, I added fresh tender corn, crunchy English cucumber, sweet juicy pineapple and finely diced jalapeño. 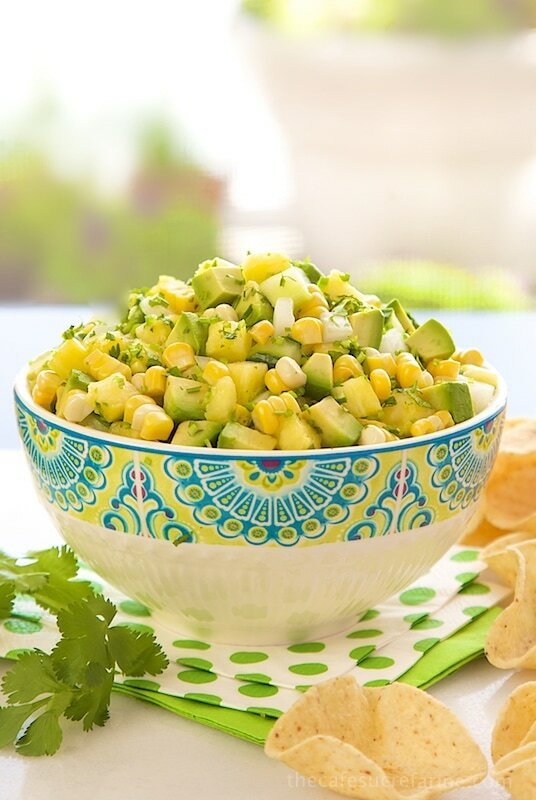 A splash of fresh lime juice, a drizzle of honey and a handful of finely chopped fresh cilantro bring everything together with lots of bright flavor. And if you want to make a really pretty salsa in a hurry (it seems I’m always in a hurry), this chopper is quite inexpensive and makes fast work of chopping fruits and veggies in uniform pieces. I use it for pineapple, cucumbers, avocados, apples, carrots, celery, onions…. I’d really be lost without it. This salsa is wonderful with chips, but would also be great spooned over grilled or pan-seared pork, chicken or seafood. I served it on a bed of ribboned Romaine and topped it with shredded rotisserie chicken breast. It made a light, yet vibrantly flavored spring lunch. Although this salsa was created with Cinco de Mayo in mind, it would be a great addition to any spring or summer menu. So, happy Cinco de Mayo to you (it’s on the 5th of May, just in case you’re wondering) and many thanks to The California Avocado Commission for their kind gift and the inspiration for this recipe! A fresh, vibrant and versatile salsa. Delicious with chips, quesadillas and grilled meats, poultry and seafood. Combine lime juice, zest, honey and salt. Stir till honey is well incorporated. Combine all other ingredients in a medium size bowl. Add lime juice mixture and stir gently till well mixed. Serve with chips or over grilled meat, poultry or fish. *I like to use this method to husk my corn. It's like magic and it removes every bit of silk with almost no effort. It also cooks the corn just ever so slightly so it stays very sweet with a bit of crunch. If fresh corn is not available, just use frozen. I like the kind that is labeled "tiny" and "super sweet". Delicious! A success with a taco dinner! Oh you crack me up! I am the same way – sometimes things have to hit me square in the head before it connects. It comes from having children, they take things when you give birth. Haha. My husband posted a picture on FB of a stainless steel sink with a big jug of Mayo laying in it. Sink-O-de-Mayo was the caption. Hahahahah. Anyway you are one lucky lady to get all those gorgeous avocados! And you made a wonderful salsa too. 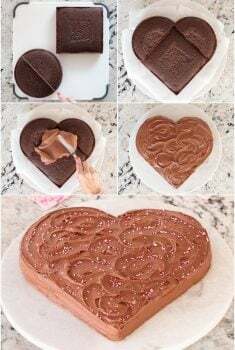 This is a great recipe and thanks for the funny! I’m sorry to be so behind on reading and commenting – such an incredibly busy week. I hope you have a wonderful Mother’s Day Chris! I love this salsa for summer, the pineapple is such a fun addition! 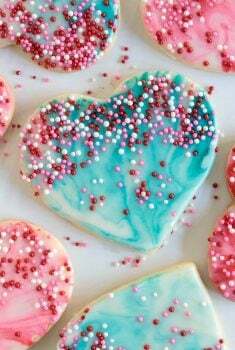 The colors are so enticing! You certainly know how to make avocados shine! You and avocados are a perfect pairing. The recipes you come up with are the best. I’m looking forward to having this on grilled meats this season. This sounds delicious and perfect for summer. Chris, my dear! 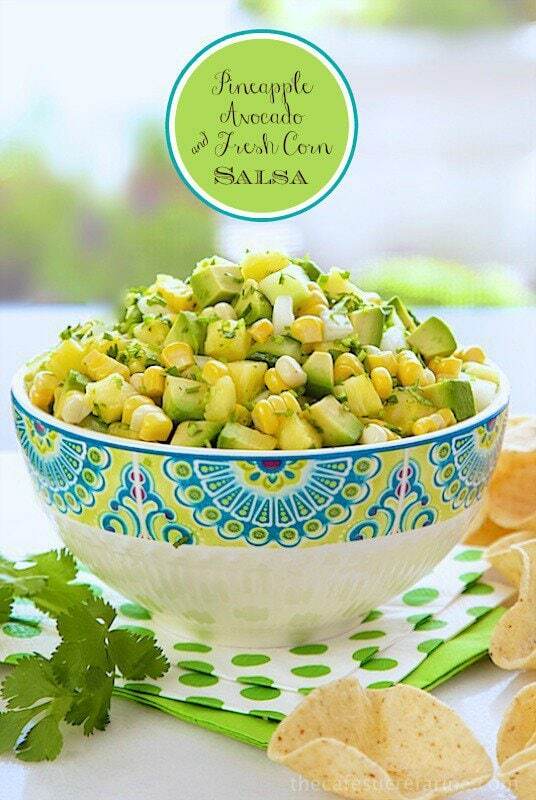 You combined 3 of my fave ingredients in one single bowl… I want this salsa! I loved to be welcomed by your husband and you together when I landed on your page, What a great pic! I would be thrilled to get a huge box of avocados – lucky lady. 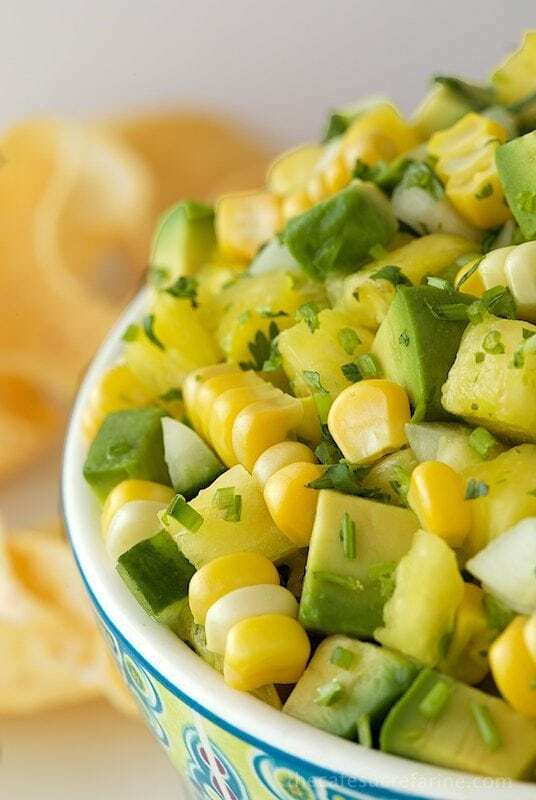 The avocado salsa looks wonderful! Sweet, savory, and tangy dressing. 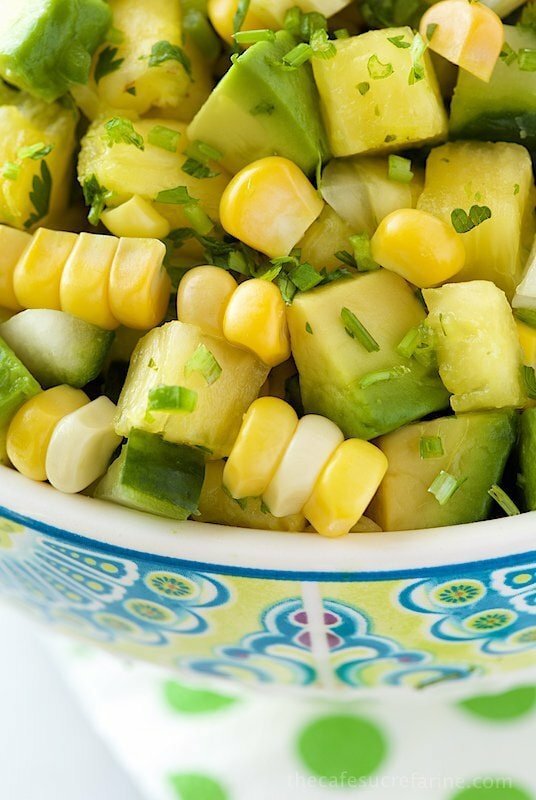 Then comes different textures, from crunchy cucumbers to creamy avocado, I love this salad, beside the different flavors it can easily replace a meal! Beautiful presentation…I know I will love this salsa! What a wonderful salsa Chris! 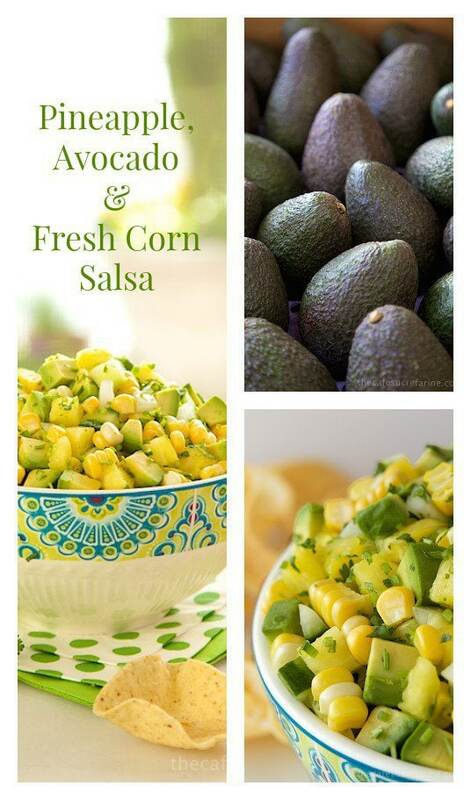 avocados are my favorite food and are always so delicious paired with corn. Great combination! Excellent choice of ingredients after all avocado is one of my favorite! so fresh ! i cld eat the whole bowl by myself! and salsa with chips is a fabulous idea! 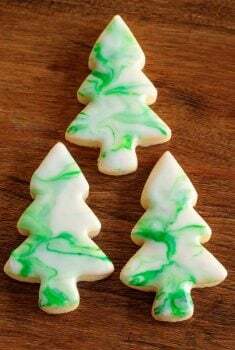 Your recipe sounds delicious, and your photos are lovely! I can just eat this as the dinner! It looks super, Chris, and gorgeous vibrant clicks. Woo hoo indeed! I am envious of that shipment! 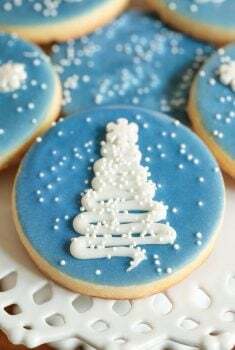 They are indeed beautiful, and so is your dish.what a wonderful gift. Avocados are quite expensive around here. Oh my gosh, I could make a meal (or two!) of this, Chris!